By detecting continuous crop marks on the printed matter, complex contour cuts of shapes will be continuously made, making individual adjustments automatically. By detecting a maximum of 4 points, cutting is made with high accuracy while minimizing distortion at the time of printing and laminating. Also, a light pointer enables to make position adjustment of crop marks easily. Light pointer to easily adjust the head position to crop marks. Nested images in both X and Y axis can be cut aligning each image automatically. With our own half cut function, the backing sheet can be cut leaving a little bit of half cut connecting points, which can be easily detached when necessary. Various media without backing sheets can also be cut. FineCut8, plug-in software applicable for CorelDRAW and Adobe Illustlator, draws out 100% the high functions of CG-60SR. Capable to respond to high-level cutting needs such as creating cut data from image data, division cutting of long media and setting of overlap space with tiling function. Outline can be traced automatically from bitmap image. Path created by outline extraction can be modified easily. Plot data used in other cutting software can be taken in so as to use these in FineCut as well. Having selectable clamp pressure with high and low setting, slipping of long sheet is prevented with high pressure and with low pressure damages to media by gild rollers are averted. Selectable three jog speeds ensures proper and easy positioning of the head to the point. 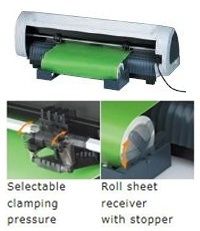 Roll sheet receiver with stopper can set the material correctly. Meandering of rolled media is prevented and highly accurate long sheet cutting can be made. Special adaptor to use commercially available pens, manual sheet cutter, USB interface are included.